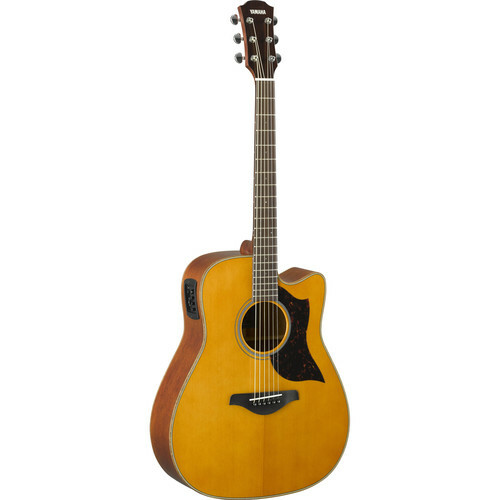 The A1M from Yamaha is an acoustic/electric guitar with a traditional Western cutaway body, featuring a solid sitka spruce top, mahogany back and sides, and a vintage natural finish. Its single cutway body was developed with scalloped bracing for louder, richer acoustic sounds, and allows players unfettered access to the higher frets. The African mahogany 3-ply neck features a 20-fret rosewood fingerboard with hand-rolled edges, which provide added comfort while playing. For electronics, the A1M is outfitted with a System72 preamp and SRT piezo pickups to ensure solid plugged-in performance. The preamp offers several advanced features including a volume control, a built-in tuner, a 3-band EQ, and a mid-frequency control. The A1M ships with a soundhole cover and a hex wrench.